Catholics Should Not Try To Convert Jews, Vatican Commission Says : The Two-Way Jews don't need to be converted to find salvation, according to a major new document that highlights Catholics' historic ties with Judaism. 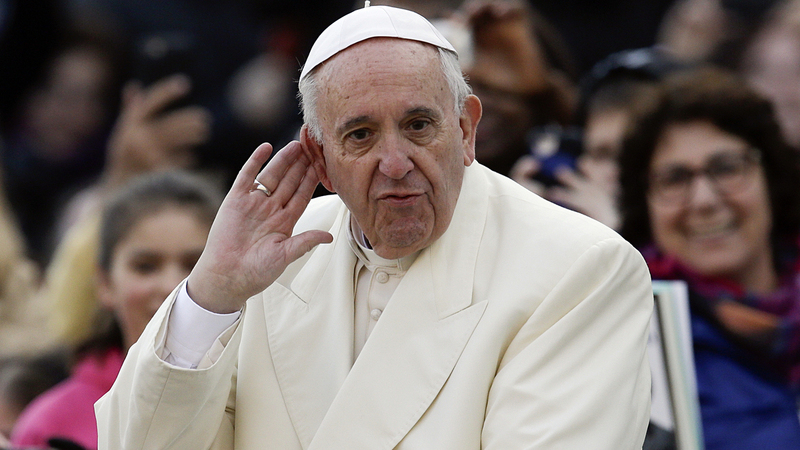 Pope Francis, seen here listening to music in St. Peter's Square Wednesday, has said "a rich complementarity" exists between Jews and Catholics. Furthering a thaw in relations that began 50 years ago, the Vatican has released a new document about Catholics' historic ties with Jews, whom Pope Benedict once called the church's "fathers in faith." Among the panel's conclusions: Jews don't need to be converted to find salvation. "While affirming salvation through an explicit or even implicit faith in Christ," the Vatican document reads, "the Church does not question the continued love of God for the chosen people of Israel." Titled "The Gifts and Calling of God are irrevocable," the 10,000-word document calls for Jews and Christians to work together to make the world a better place by combating poverty and human suffering. "The new document states that owing to the Jewish roots of Christianity, Catholic dialogue with Judaism cannot in any way be compared with dialogue with other world religions. It says Jesus can only be understood in the Jewish context of his time. "That document repudiated the idea of collective Jewish guilt for Jesus' death. "The new document says that from a detached coexistence, Catholics and Jews have arrived at a deep friendship. And it says Catholics must refrain from active attempts to convert Jews." The Vatican commission includes the work of Cardinal Kurt Koch and the Rev. Norbert Hofmann. They presented the results of their work Thursday alongside Edward Kessler, founder of the Woolf Institute in Cambridge, U.K., and Rabbi David Rosen, the American Jewish Committee's International Director of Interreligious Affairs. "Pope Francis states that 'while it is true that certain Christian beliefs are unacceptable to Judaism, and that the Church cannot refrain from proclaiming Jesus as Lord and Messiah, there exists as well a rich complementarity which allows us to read the texts of the Hebrew Scriptures together and to help one another to mine the riches of God's word. We can also share many ethical convictions and a common concern for justice and the development of peoples' ('Evangelii gaudium,' 249)." Discussing the document today, Rosen said, "the very fact that we can talk about complementarity is itself a powerful demonstration of how far we have come along this remarkable journey of transformation and reconciliation between Catholics and Jews over the last half century." "Judaism is not to be considered simply as another religion; the Jews are instead our 'elder brothers' (Saint Pope John Paul II), our 'fathers in faith' (Benedict XVI). Jesus was a Jew, was at home in the Jewish tradition of his time, and was decisively shaped by this religious milieu (cf. 'Ecclesia in Medio Oriente,' 20). His first disciples gathered around him had the same heritage and were defined by the same Jewish tradition in their everyday life."